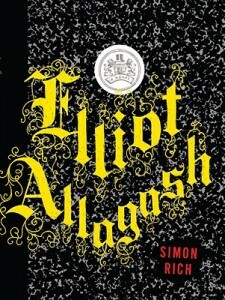 I read Elliot Allagash in one three-hour sitting. It was mildly entertaining, and I remember laughing once or twice, but ultimately it’s a remarkably slight novel that felt like a padded novella with pretensions of bigger things. On the other hand, its slightness does work in its favor, making it a quick, easy read, and I finished it before it could lose my interest or outstay its welcome. The book charts the transformation of one Seymour Herson from chubby high school outcast to aloof popular kid cheating his way through life. His ascendancy comes thanks to a sociopathic billionaire teenager named Elliot Allagash, who appoints himself Seymour’s personal svengali and immediately begins stage-managing his life down to the finest detail. The characters are fairly one-dimensional. Elliot is always scheming, Seymour is always nervous, and they’re surrounded by cardboard cut-out archetypes. The overall trajectory of their story isn’t particularly surprising, but the author does get a few points for absurd details thrown in along the way. Elliot’s convoluted revenges against his “enemies” do help keep things interesting now and then. To be honest, I really only started reading it because it was due back to the library in a few days, and I finished it because it didn’t take that much effort once I started. Overall, it was an inoffensive way to spend a few hours, but nothing I’d go out of my way to recommend.